Is It Wrong to Perform at Michfest? With the Michigan Womyn’s Music Festival sticking by its policy against admitting openly transgender women, some performers distance themselves or keep quiet. 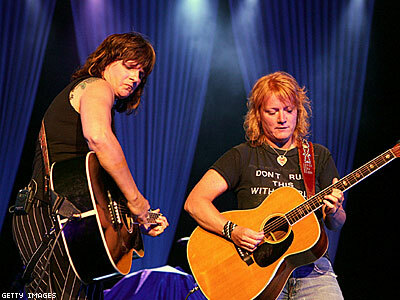 Iconic pop duo the Indigo Girls have long been a staple at the annual Michigan Womyn’s Music Festival, but this is the last time Emily Saliers and Amy Ray will take the stage — unless the festival reverses a long-standing policy that only “women born women” may attend. “It became clear that we had to take a stand and let people know exactly how we felt,” says Saliers. She and Ray issued a statement on their website in April announcing that while they will perform this year, it will be their last until Michfest moves to formally admit transgender women after nearly four decades of being excluded. Saliers and Ray also vowed to donate any money made from the performance to trans activism. They plan to use the stage as a pulpit to discuss the issue, and their statement has already helped start the debate. On August 6, the Michigan Womyn’s Music Festival will take place, with roughly 3,000 women in attendance, as it has for the past 38 years in the remote woodlands of Michigan. It began with a simple, yet radical idea: an annual gathering where women alone could congregate from around the world, pitch tents, and enjoy music. Yet its bedrock separatist credo of being an event to create safe space solely for “women born women” has increasingly come under fire as discriminatory, and even transphobic. The conflict reached a boiling point in April, when writer and comic Red Durkin, a lesbian trans woman, launched a Change.org petition calling on performers to boycott the festival until its organizers would “explicitly welcome all self-identified women.” The petition now has more than 2,000 signatures. Poet Andrea Gibson dropped out of this year’s lineup. Conversely, songwriter Melissa Ferrick, who admits she’s waffled on the issue in recent years, plans to perform. “I believe boycotting should be a last-resort tool for activism when dealing with like-minded folks with whom you generally share political solidarity and a grassroots worldview,” Ferrick says. Other performers reached by The Advocate were loath to take sides. In its early years, second-wave feminists and members of an erstwhile fledgling lesbian movement traveled to Michfest simply to revel for a week in the clothing-optional atmosphere “on the Land,” and escape the typical trappings of patriarchy and homophobia. Many of those women — now with children in tow — still return for that same experience. Saliers theorizes that history is why some Michfest attendees continue to support excluding trans women: “It’s this great fear that this really, really small community will come in and take over and ruin the institution of a safe space that women born women have created." Lisa Vogel, 57, a founder of the festival and its artistic director, is no stranger to controversy. “In my 38 years of being involved with this festival, there have been a fair number of junctures where the festival has come under fire,” Vogel says. “In the beginning it was because it was a women-only event. It was construed as anti-male." Vogel released her own statement on the heels of Durkin’s petition, essentially reiterating the women-born-women position. “I respect the politics of separate space,” she says. “What I am trying to address in my statement is that if you are born female, deemed female at birth, raised as a girl, experienced the rigid enforcement of gender hierarchy from the time that you are a baby, you have a certain shared group experience that is different from someone who was born, deemed male, and raised as a boy." “There has been a fair amount of — we’ll call it feedback — that has at times been discussion and at times been very ugly,” Vogel says. “That’s been extremely challenging because [the festival] is a space built out of love." Michfest has a legacy of fostering an open-armed community among a multiplicity of types of women, from across the spectrum of femininity to masculinity. Yet its history is also marred by discrimination. In 1991, Nancy Burkholder was expelled from the festival after being asked if, and confirming that, she was a transsexual woman. That event in turn sparked the annual protest gathering of Camp Trans and the birth of a more recent group, Trans Womyn Belong Here. The group's members attend the festival with the hope of taking “active steps towards welcoming all woman-identified women to the festival,” according to the group’s Facebook page.